On this page, there is a comprehensive list of information on managing the account's order status and financial information. 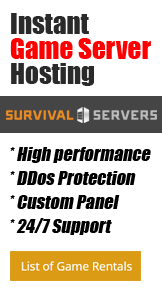 To cancel your game server, submit a support ticket with which game server that is to be canceled. If you wish to download any saved data, you can do so by viewing the Server Saved Files page and finding out which files you need to copy down. Eligibility to change to a new game server is available only when your server has a certain amount of subscription time is left. Below is the breakdown of the time frame for a game server change. As long as one month's subscription time is left. As long as 24 days of subscription time is left. Which game server you want to change. Which game you want to change the server to. Any subscription slot or length change. For information on on removing all of your personal information per GDPR, please submit a support ticket to request your personal data to be deleted and we will handle this for you. This page was last modified on 11 April 2019, at 10:38.